Here's how you can be the best ride Pikachu has ever had. It's likely that Niantic will tweak the game in the future & I'll have to rethink the list below. But, while they're working to release the game in more countries, prevent hacking, block cheaters, & improve server performance, the game mechanics will probably stay the way it is for the coming few months. If you're new to the game or have just started out, the following is what I've learned trying to master the game for the past few months & would have been really helpful to know right from the start. You can walk around trying to triangulate Pokémon in your "Sightings" list like I did when I first started playing the game. But, you're severely limited to the pokémon in your immediate vicinity & you'll probably end up trying to track the dreaded ratatas or zubats. Instead of going to where the pokémon are, let the pokémon come to you. Pokémon spawn more frequently where there are dense concentrations of players. For example, Central Park is the Pokémon HQ of NYC. 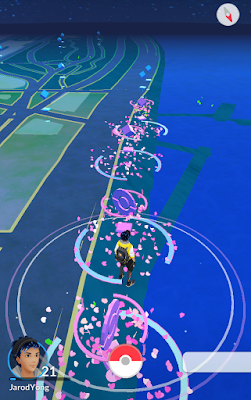 Just find where the horde gathers (usually between several lured pokéstops) & you'll find more pokémon than you can catch without needing to walk around or spend lures/incense. You'll find rare pokémon too. I wasn't kidding. 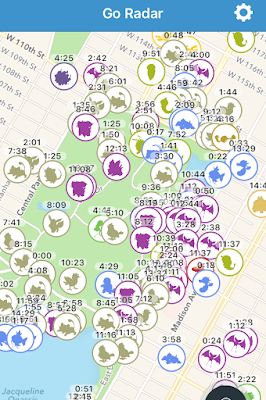 This is the pokémon action in Central Park, NYC. If you really want to talk around, you can use Ingress to track spawn locations. Or, be smart & know exactly where to find the pokémon you want with a reliable app like Go Radar (refer to pic). After playing the game for a while, I had a feeling that lures & incense were useless. So I decided to test my theory out at an empty park (to avoid the positive effects of having multiple players in one area). I set up a lure at a pokéstop, turned on incense, & walked around the area (because incense is theoretically more effective when you're moving). At a place with very few players, the lure & incense performed abysmally. During that 30 minutes I spent in the area, only 5 pokémon spawned in total. 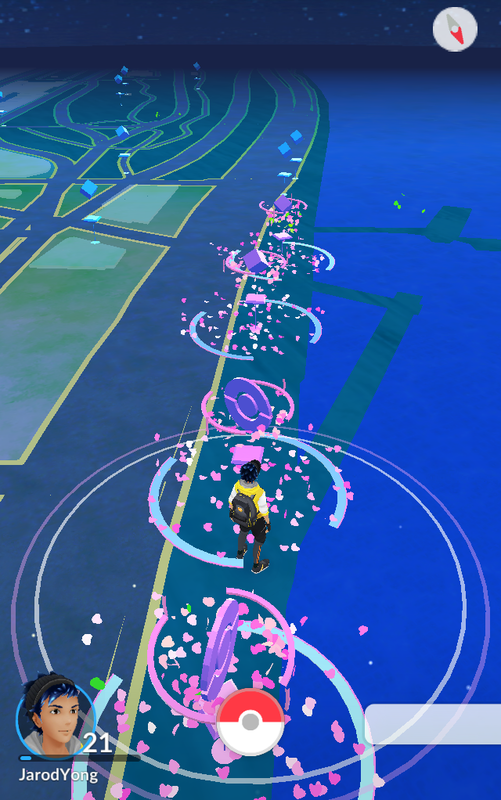 The lure attracted only 1 pokémon while the incense attracted only 2. 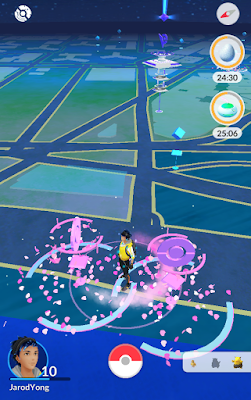 You can easily tell if a pokémon spawns because of a lure or incense. Pokémon that spawn because of a lure have pink ripples underneath them while incense spawns pokémon with a pink cloud circling underneath them. Pokémon that spawn normally have yellow ripples underneath them. Don't use your incense or lures yet. Theoretically, the best time to use incense. Save them for when Niantic makes them more powerful. They will if they want people to spend money on them. When that happens, you may want to stack lures & incense. But, you'll probably end up with the pokémon that typically spawn in the area, i.e. zubats & ratatas. So, you'll want to stack em where rare pokémon typically spawn & do it where large concentrations of players gather. If you're at Level 30, you'll have received at total of only 9 Lucky Eggs as rewards for leveling up. So, use them wisely! I innocently wasted my first 3 & lived to regret it as I'm inching my way to level 25 right now. Use those precious 30 minutes of double experience to evolve pokémon. Don't do anything else. Also, use it after Level 20 because that's when you'll need large amount of experience points to level up. Also, pokémon get harder to catch as you level up so it'll be wise to catch as many pokémon as you can at the lower levels. I can't tell you how many times I've had to use 7-8 balls to catch a pidgey or zubat after Level 20. Powering Up a pokémon involves using Stardust which takes effort to accumulate (catching pokémon & holding gyms). As you level up, you'll hatch or catch pokémon with ever higher CP so there's no point in Powering Up even your strongest pokémon. FYI: Pokémon from Eggs max at level 20 while wild pokémon max at level 30. So, at Level 19, you'll get the highest level pokémon from Eggs &, at level 29, you'll get the highest level pokémon from the wild. c) has a move set with the highest DPS (with STAB) possible. I mark my pokémon with ' for 70% IV perfection, " for 80%, & * for 90%. I star those with perfect move sets. 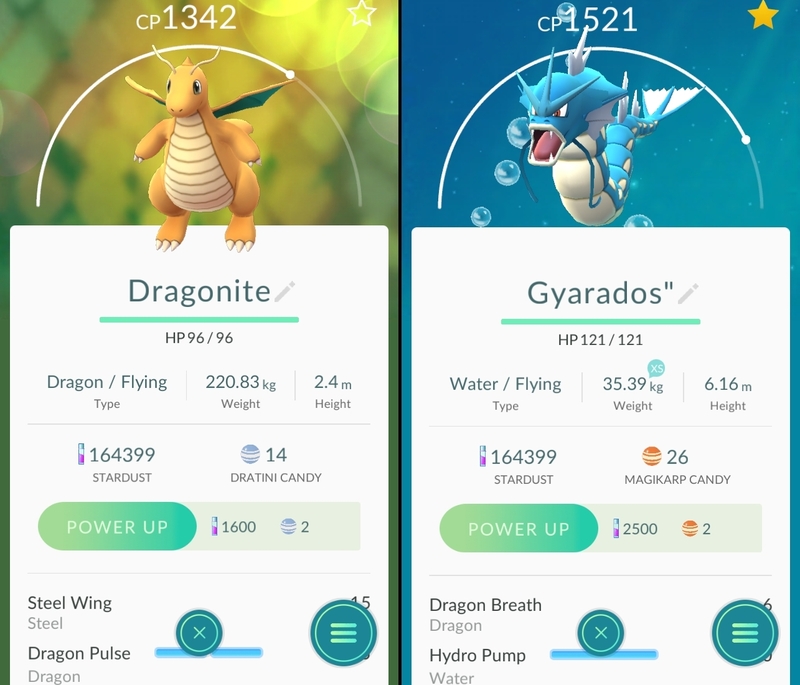 Dragonite has poor IV & move set so it's going to be recycled for candy. Gyarados has 80% IV perfection & the best move set so it's good for a Power Up. There are 18 types of pokémon: Normal, Fire, Water, Electric, Grass, Ice, Fighting, Poison, Ground, Flying, Psychic, Bug, Rock, Ghost, Dragon, Dark, Steel, & Fairy. Ideally, you only want to Power Up the best pokémon for each type. You may want to have 1 for attack & 1 for defense. Each pokémon has hidden Attack, Defense & Stamina stats called Individual Values (IV). Use an IV Calculator to figure out the IV of the Pokémon that you catch. The IV determines the max CP of a pokémon & also how much CP increases when you Power Up a pokémon. So you'll want to spend your precious Stardust on a pokémon that has close to perfect IV (70% & above). FYI: Hatched pokémon have better IV (above 70%) than wild pokémon (random %). The same pokémon may have different attack moves. These moves are assigned at random & cannot be influenced. The best moves have the highest Damage Per Second (DPS). Also, pokémon that use a move of the same type will gain the Same Type Attack Bonus (STAB) of 1.25. Gym battles &, especially, gym training are time & effort intensive. It involves repetitive rapid screen tapping, healing & reviving for an insignificant amount of experience to your trainer. Once the novelty wears off, it can get very frustrating. While you're at it, you might as well learn to dodge & learn about move type advantages & resistances. If you have a high HP pokémon at a low-traffic gym, you can try to capture another more gyms before claiming your reward. Alternatively, you could stop a gym on your map that's under attack, walk over, wait for someone else to take it down, take it over, collect the reward, & walk away laughing like a madman. After you've collected your reward, don't bother with gyms anymore. Move on to trying to level up your trainer or catching rare pokémon. Pikachu is touched by your efforts. Good luck with the game! Let me know in the comments if you have any questions or if I've missed anything!